Retail $35.99 SAVE 23% ! This is a perfect starter kit for the parent/kid team, it combines a super easy to build Amazon and a little higher skill level Cross-Fire. 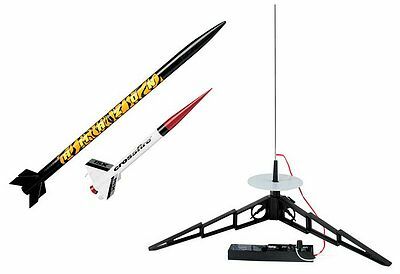 The Amazon is a plastic fin/motor mount module rocket while the Cross-Fire is a traditional cardboard tube rocket motor mount with balsa fins rocket. We ended with a slight kink to the Amazon due to the coupling being a little sloppy in joining the two sections of the rocket body together that wasn&apos;t realized until the glue had set up, the rocket still flies straight though so I haven&apos;t felt the need to correct this cosmetic issue (besides, I&apos;m the only one who can see it). Both rockets fly good with the Cross-Fire being a fast mover and the Amazon launching like it has some mass and building steam. The launch pad that comes in this kit is a pretty sturdy unit and is impressive for the entry price to rocketry, it breaks down easily for transport and storage and makes accommodation to mount other guide wire diameters so you can launch mini&apos;s. The launch control we received with our kit was yellow but otherwise is the same as pictured, it has a safety key that my 5 y/o is unable to press and make the connection necessary to launch, as a result it takes both of us to launch a rocket (which is good). We have not had a failure to launch with this controller with one exception that was easily attributed to a faulty igniter. Two easy to assemble model rockets built with a cardboard body tubes and plastic cones. Amazon has colored parts including plastic fins. Crossfire ISX has laser cut balsa fins. Depending on the engine of choice, the Amazon can fly up to 600 feet high and Crossfire an amazing 1150 feet high. Nice kit but the launch system is different than the one pictured. Two great rocket to get started into the hobby. Built them with my son and it was great. Great directions everything we needed but the motors and a battery. Wish the launch was the one pictured as the one supplied is a cheaper version. "Excellent buy for those starting in the hobby"
With the exception of motors and batteries, this set has everything the first timer needs to get started in the hobby. The Amazon is a credible almost ready to fly bird that can be built the night before your first launch, and is a decent performer on small fields when loaded with a B6-4. Once you wet your whistle with the Amazon, move on to the Crossfire, which adds beginning construction and painting techniques to the mix. These rockets have been designed specifically for use only with Estes products. Use of these products with any other brand-name rocket product containing any defect or causing any damage may void the Estes warranty..